One of the target audiences of Transperth’s “Two Hoots” campaign are bikers who use public transport. Photo by Sally. In Perth, Australia, residents are fed up with anti-social and rude behavior on public transport. In an effort to reward riders who care about the comfort of their fellow passengers, Transperth – part of the Western Australia State Government’s Public Transport Authority – launched the “Two Hoots” campaign. Now a well-recognized name in Perth, Two Hoots provides an umbrella brand for all campaigns addressing behavior on public transport in the city. By using innovative methods, including nursery rhymes and comic books, Two Hoots seeks to improve the experience of urban residents on public transport – an important way to ensure that they choose mass transit over private vehicles. Two Hoots began with the rewriting of eleven popular nursery rhymes in order to teach young folks about considerate behavior on public transport. The rhymes tell stories about characters ranging from Little Bo Peep who fell asleep to Jack and Jill, who nearly missed their bus and caused the schedule to be disrupted. A printed book of the rhymes was handed out to passengers, and posters of selected rhymes were put up at major stations and on Transperth’s buses, trains, and ferries. Rewards cards were handed out with the books, which were redeemable online for gifts and an entrance to a drawing featuring prizes including zoo tickets, bikes, and an iPad. By getting people engaged online, Two Hoots rewarded passengers for learning about the common courtesies expected on Transperth services. 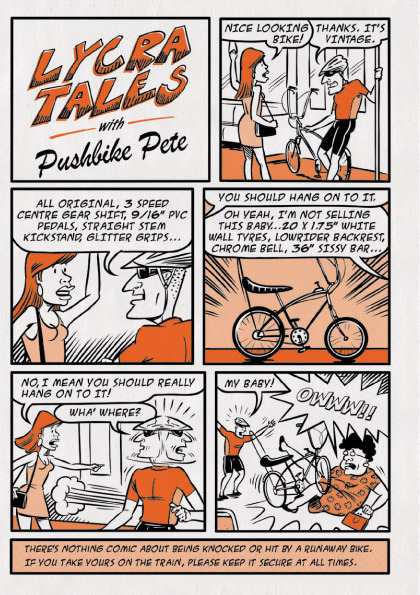 The most recent addition to the Two Hoots campaign is a comic book detailing the annoying habits of characters like Pushbike Pete, Susie Hawker Noisy Talker, Selfish Sam, and Brendan Bevan’s Badly Behaving Backpack. 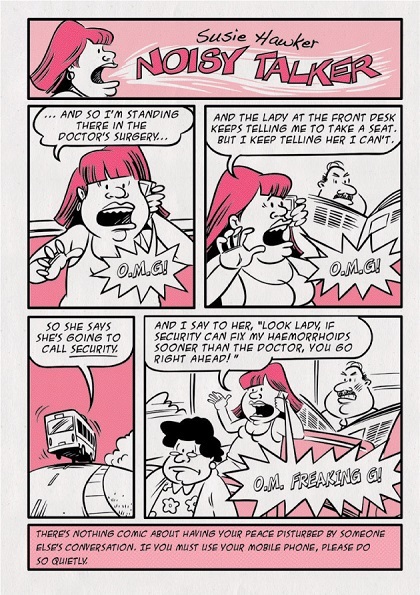 Although lighthearted, the comic book gets to the heart of aggravating behavior we’ve all experienced on public transport. Pushbike Pete’s character serves to encourage bikers who use public transport to keep their bicycles secure at all times. Photo by Transperth. Susie Hawker Noisy Talker disrupts her fellow passengers by talking too loudly on her mobile phone. Her character gives Transperth passengers a friendly reminder to keep the noise level down. Photo by Transperth. 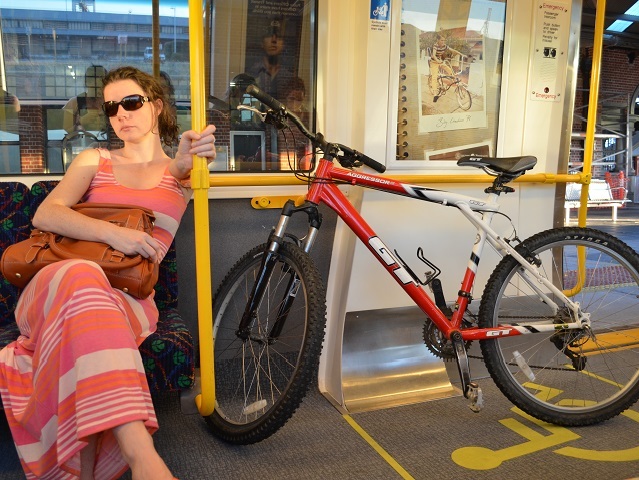 Perth isn’t alone in challenging undesirable behavior on public transport in innovative ways. The Travel Better London campaign is using poetry to improve mobility throughout the city, and the power of social media is helping promote Bus Rapid Transit (BRT) systems in India, like Indore’s new iBus. Queensland Rail, another Australian operator, employs a public service announcement (PSA) style campaign regarding train etiquette. 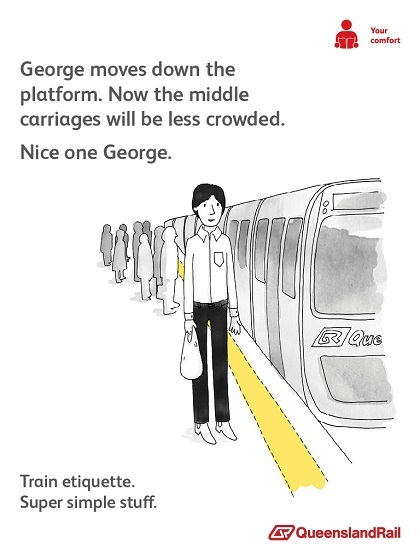 Queensland Rail uses PSA style posters like this one to publicize simple train etiquette. Photo by Queensland Rail. Ensuring that passengers have a comfortable experience while riding public transport is essential to the longevity of any mass transit system – it should be a top concern of public transport operators along with other building blocks of marketing sustainable transport. To find out more about the Two Hoots campaign, check out this video from Transperth.